So not only did Nerd Lunch hit triple digits last week, now Cult Film Club is hitting double digits. 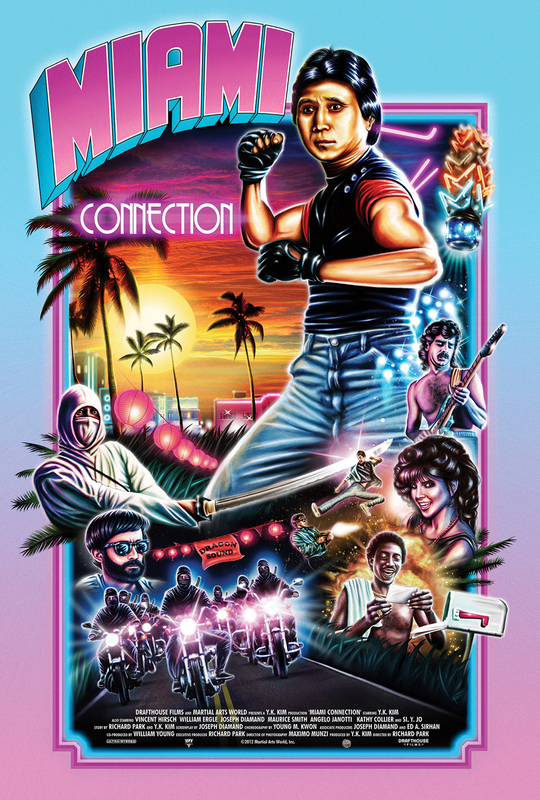 Welcome to Episode 10 in which we discuss the independent movie sensation of the year, Miami Connection. Released to very little fanfare in Orlando (and Germany?!) back in 1987, the film was found on eBay last year and bought by Drafthouse Films for $50. Now it’s getting worldwide theater and home video releases with the actors reunited for special fan events like every damn week. It’s nuts how popular this movie has become. So, being that we are Cult Film Club, we felt it was our duty to forgo our original movie pick for this month and check out this masterpiece of dramatic biker ninja action. Do you like feathered hair, white ninjas, aligator earrings and orphans reuniting with their dads? Then you’ve come to the right place. Download this episode from iTunes or listen to it online right here. This entry was posted on September 4, 2013 at 12:13 pm and is filed under 80s, movies, nostalgia, podcast, pop culture with tags Cult Film Club, martial arts, movies, ninjas, podcasts, pop culture. You can follow any responses to this entry through the RSS 2.0 feed. You can skip to the end and leave a response. Pinging is currently not allowed.